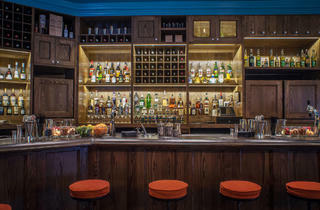 Most big-deal cocktail dens were launched by a singular personality (see: Jim Meehan of PDT, Phil Ward of Mayahuel). 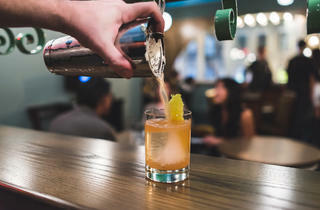 Toby Maloney—a bartending O.G. at the legendary Milk & Honey and Pegu Club—boasts enough star power to roll out a spot on his own. But the gifted drinks slinger, along with business partner Jason Cott, recruited top cocktail talents Joaquín Simó (Death & Company) and Troy Sidle (the Violet Hour) to form something of a booze-powered Fantastic Four. 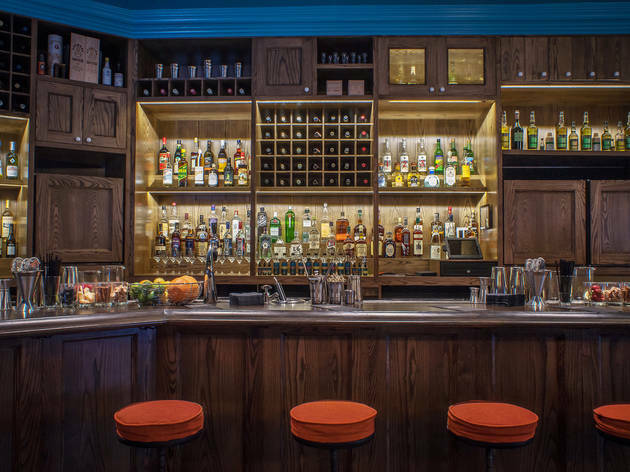 The team has set up pioneering bars across the country in places like Nashville (the Patterson House) and Chicago (the Violet Hour), as well as working on consulting gigs in Gotham. Pouring Ribbons marks the all-star squad’s solo debut in New York, with one of the year’s most exciting new drinks menus and a capacious teal-daubed barroom. DRINK THIS: The selection offers drinkers a fresh approach to picking their quaff (each $14). Each tipple is measured on two scales: refreshing to spirituous (how boozy do you take your drink? ), and comforting to adventurous (do traditional or quirky flavors appeal?). In the mood for a potent classic? Try the Sweet Valley High—something of a martini-negroni mash-up built with refreshing Tanqueray No. Ten gin, sweet vermouthlike Cocchi Americano, a splash of bitter Campari and floral St.–Germain. 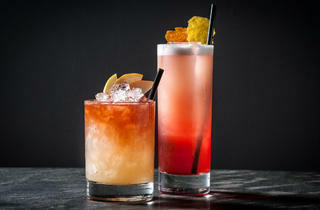 Or for something that falls in the middle, order the crisp autumnal sipper Ragin’ Glory. Old Overholt rye whiskey and pear brandy form the cocktail’s base, which is brightened with lemon juice and spiced up with homemade cinnamon bitters. GOOD FOR: Novelty-seeking cocktail hounds, civilized group boozing and a second-date hideaway. 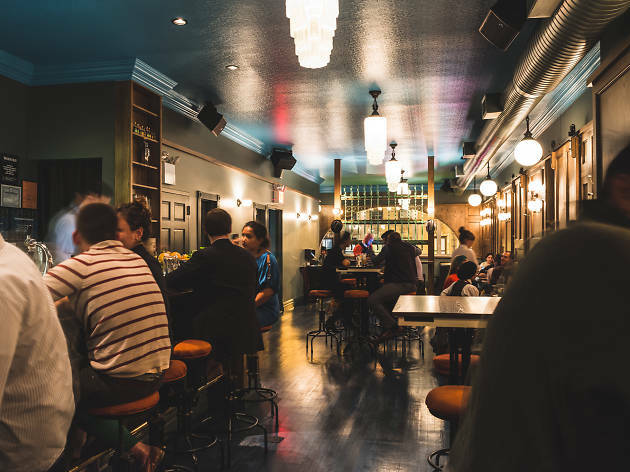 Located above a scruffy liquor store on Avenue B, the airy second-floor drinkery is appointed with milky Art Deco lights and wood paneling. 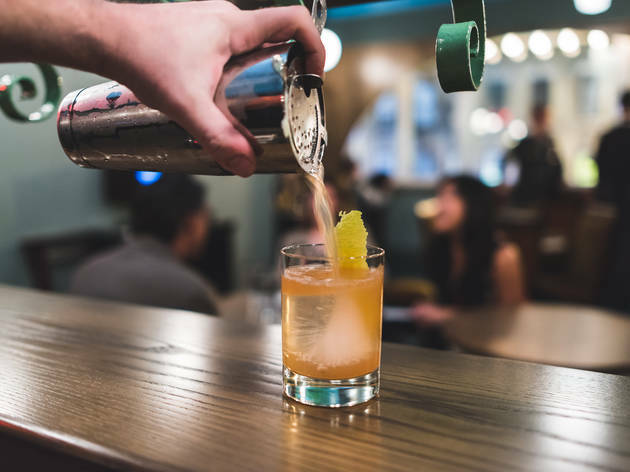 Claim a barstool to watch a pro expertly stir your drink in a beaker-like glass, or settle your crew into one of the cozy dark-gray banquettes. THE CLINCHER: Chartreuse—an herbaceous high-proof liqueur made by the Carthusian monks since the 1700s—is revered by drinks geeks the world over. Here the French spirit takes a turn in the limelight with a special list of 15 different bottlings. School yourself on the difference between 2012 Green Chartreuse and the mellower, sweeter yellow version ($6 per ounce). If you order an aged vintage (like a 1970s Yellow, $22.50 per half ounce), bartenders will pour a gratis taste of this year’s product for a side-by-side comparison. 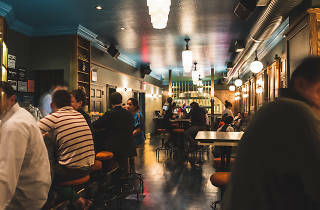 My favorite place for a night cap in the East Village- less crowded than the other speakeasies in the neighborhood, but has has definitely gotten a bit more popular over the last few years- They have great cocktails, and the bar tenders are very knowledgeable. If you're like me and get overwhelmed by complicated cocktail lists, you'll love their handy chart that helps you understand what a drink will taste like (boozy vs refreshing, etc). A great cocktail speakeasy that isn't as frequented as other speakeasies in the neighborhood like Death & Co or PDT but is just as impressive. 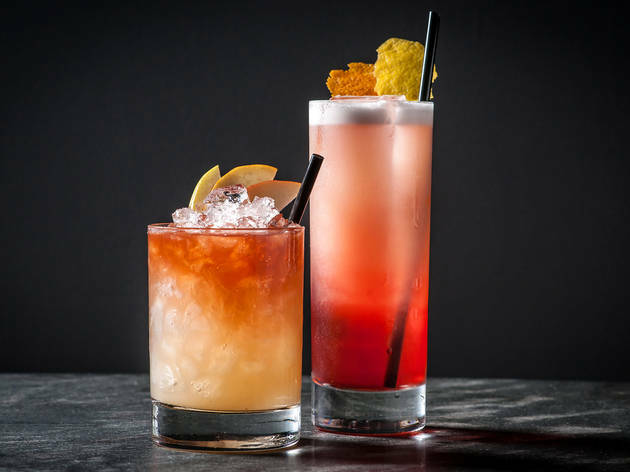 There are tons of cocktails to choose from, and you can't go wrong. This place is awesome! I live a block away and never noticed it and now I'm kicking myself for missing out. Well-crafted cocktails, relaxed but cool vibe. I went around 11 on a Thursday night and there weren't many people there. Great for catching up with friends or a fun date. The cocktails each have some sort of gimmick associated with it, which is really fun. My friend got a baseball card with his, my boyfriend got the "Flap Jack Old Fashioned and the waiter served it out of an iHop-like maple syrup container. I got the "Night at the Wigwam" and it came on a wood cheese plate with a legitimate (and by legitimate, I mean huge) teepee over it. SO COOL. We wanted to try everything just to see what came with it or how it was presented. Definitely will be back. This is the best option for those seeking fancy, elaborate cocktails but don't want to deal with any door or reservation drama—that is, if you go on a weekday. Otherwise, you may need some patience at peak times. This is where you slowly sip and enjoy your relatively elaborate drink, trade sips of your friend's choice and analyze the flavors. It's worth the price if you know what you're in for. The second-floor space is warm and roomy unlike many New York City bars. 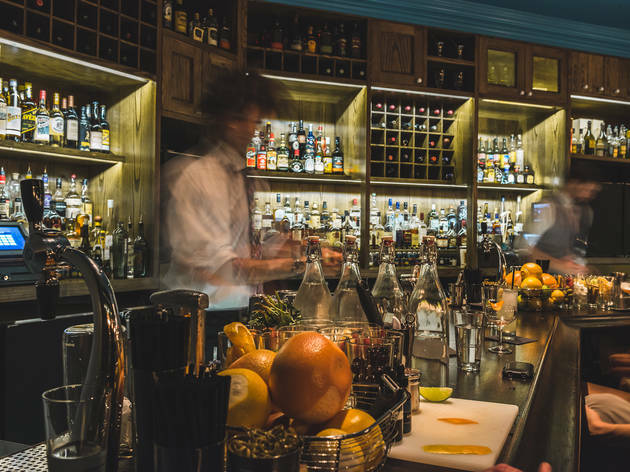 Sitting at the bar is recommended, since part of the experience is watching your drink being created. Really good cocktails and wonderful atmosphere. Go there! 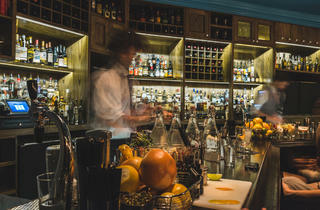 Love this place - fantastic drinks, talented staff, yummy bites. Only the Best from the most forward thinking proprietor, Jason. The best drinks and atmosphere - bar none. This bar will not be a well kept secret much longer. Very innovative mixology all around.